Walking your cat on a leash might seem bizarre, but it is actually pretty neat! Imagine going on walks or hikes with your cat. How cool is that? A cat harness is a safe and convenient way to travel with your cat. Check out our selection of the 5 best cat harnesses to go on walks, hikes, and trips with your cat! Walking a cat on a cat harness and leash allows cats to join in on adventures with their hoomans. A cat harness can also prevent a cat from having a trauma-related accident, as that is the number one killer among the feline species. 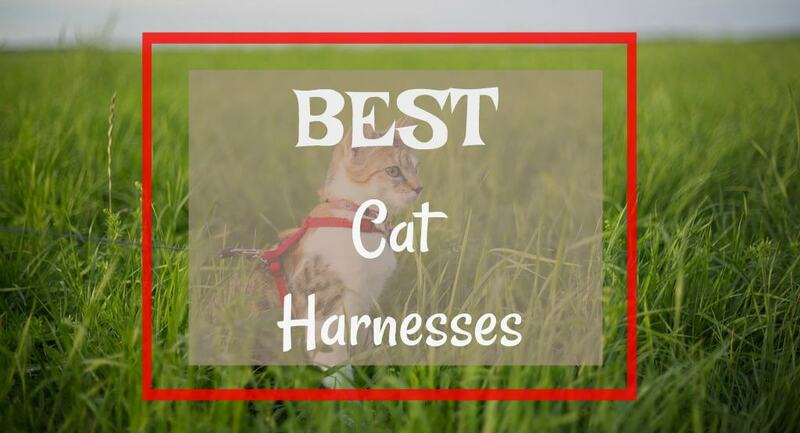 Below we detail our selection of the best cat harnesses so next time you go walking, you can take kitty safely with you! Why Buy a Cat Harness? A harness is a great innovative take on the pet collar and leash combo. As opposed to latching your leash to the collar that rests around the neck of your pet, you link it to the harness, which wraps around the chest and rests on the back of your animal. When you pull back to stop or guide your companion, the harness not only halts them more quickly, but it also doesn’t cause them harm or strain in their extremely sensitive neck area. Now you may be wondering, where do I start? How can I get my cat interested in walking with me? To start figuring out what harness would work best for your feline companion, you should see which one encompasses all of your most important priorities. Let’s do an in-depth look at some of the best cat harnesses out there. Hopefully, this pawticle will help you make an informed decision on which cat harness would be the best fit (literally) for you and your cat! Cat harnesses come in various styles, shapes, sizes, material, colors, and more. We spend our time reviewing these products so you don’t have to! Take a look at some of our top choices for some of the best cat harnesses available. 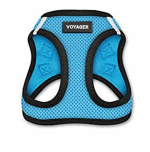 Fluffy Kitty’s choice of harness goes to the BPS Voyager for cats and small dogs. Why? Harnesses like the BPS Voyager give our kitties the comfort and safety they need in a harness. It’s easy to put on. Just put kitty’s front paws in the holes and lift up around their shoulders to secure the harness with the double safety feature. There are a durable velcro closure and an extra clip buckle with duty metal D-rings for extra security. Padded and comfortable. It is made with a breathable mesh material that comes padded. The D-rings are equally attached to the harness buckle straps on either side. That means no neck or shoulder straining when your kitty guides you around (yes cats walk their owners, not the other way around). With this feature, your cat’s weight is equally centered and the entire harness ensures a comfortable fit and protection. Reliable and affordable. 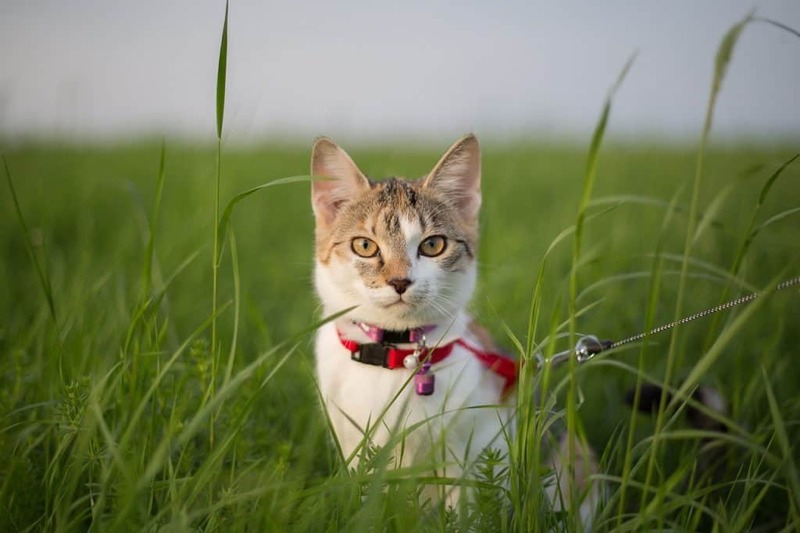 Thousands of cat owners have already tested this harness and give it a super thumbs up. When it comes to our Yoda, I always want to see what other cat moms say about a product before I invest. Remember, protection and safety for your kitty is number one. Cute designs and colors come after you choose the best fit for your cat. Not to mention, this harness is available at a very affordable price! Follow the size chart on the product page to make sure you get the right fit for your cat. Too big can create gaps which can allow your cat to slip out of the harness easily. Too tight can prevent your cat from breathing or from walking normally. If your kitty is the ultimate adventurer, then check out the “True Adventurer” harness and leash set by Your Cat Backpack! We recently tested out this harness on Yoda and it is super secure, breathable, and stylish. Make sure to measure your cat before purchasing! Your Cat Backpack has a measurement guide on their shop you can use. Discount Codes! 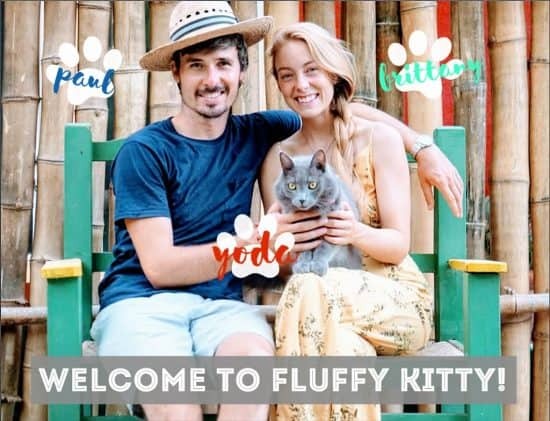 Use “FLUFFYKITTY” to get $10 off your purchase when you shop for cat backpacks, harnesses, and more online at Your Cat Backpack. If you live outside of the U.S. use our code “FLUFFYKITTYSHIPPING” to get free shipping! We love when something has a variety of purposes. 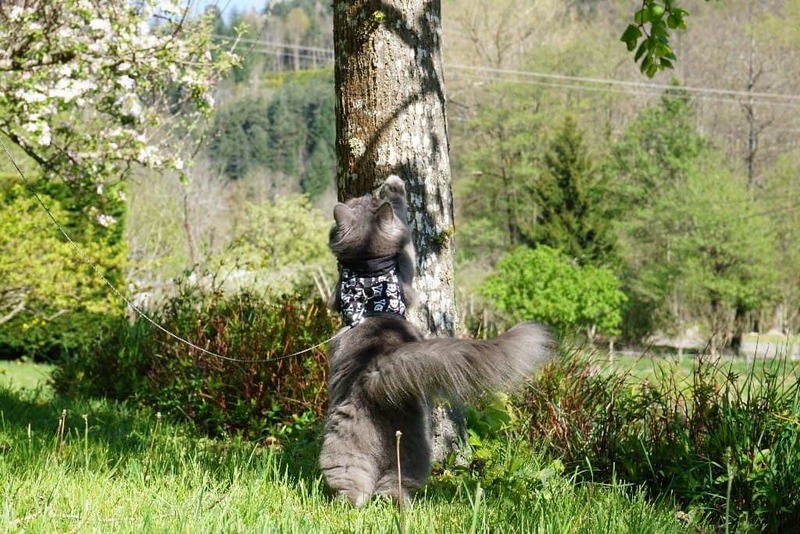 With the FUNPET soft mesh harness, you would be able to use this for both your cat or a small dog. 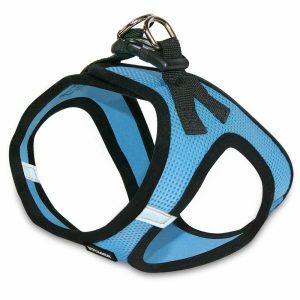 This easy-to-use harness comes in a multitude of solid colors for the choosing. The sizes for this harness are XS-Medium, with measurements to help you know which size to order. 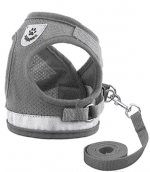 The harness is also made up of 100% polyester that is covered in a breathable mesh material for comfort. Most cat owners rave about the cushioned feel of the harness, as well as how easy it is to adjust the straps to fit your cat more appropriately. The harness is sturdy and is made of quality material to ensure a long lifespan of the product. Most cats even seem to enjoy wearing it and have adapted to it being placed on them for a nice walk. On the more critical side, some owners have found that this harness does run small, and with the lack of strap around the neck, placing it over your cat can become a daunting task. While most cat owners rave about the color, one reported that the harness does get dirty pretty easily (maybe order a darker one?). 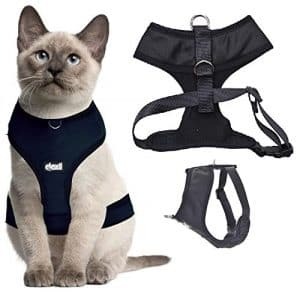 Another harness option for your feline is the Dexil Luxury cat harness. This harness is made with a soft cushioned material that is light enough while offering basic safety features. A great choice for beginners. Water-resistant and simply-designed, this cat harness is great for your cat’s minimalist taste. The harness is easy to use in regards to putting on your cat. The straps are adjustable to make the fit more appropriate as well, but pet owners have mixed feelings. The sizing ranges as either a small-medium or a large-XL fit, with measurements available. Many cat owners love the easiness of placing it over their cat, and how comfortable their cat seems to feel in it. Some negatives about this product were that some cats slipped out of it pretty easily. The stretchy material and bulkiness of the harness makes a bad combination for a curious cat to escape out of. If you’re not looking for anything too fancy, or if your kitty is just a beginner walker, then this harness is a good choice. Otherwise, you can definitely get a more sturdy and secure harness for more or less the same price. When we had Yoda as a kitten, we started him off with a simple and light harness. Actually it was similar to this one so he could get used to it around his body while he explored. Now that he’s a real outdoors adventurer, we have upgraded to a more comfortable and secure harness (like our number 1 choice). Purrfect for tranquil strolls around your local park or backyard. 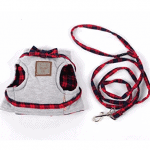 This one-of-a-kind styled harness is not only adorable, but it also comes with a matching plaid leash. The Bestag cat harness is made of cotton, knitted fabric and has a velcro latch. The material is breathable and will keep your pet comfortable, both in feel and in body temperature. There are two different styles this vest comes in. Either red and black plaid with a gray vest, or yellow and black plaid with and green vest. The sizes range from SM-XL, with measurements available for your use. Many cat owners who have purchased this have claimed that their cat is safely latched in, and cannot escape easily while in this harness. Sizing and comfort are two well-rated aspects of this harness. Kitty parents claim that their cats even seem quite content when wearing it! 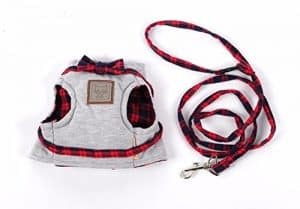 The critical review of this harness reports that the leash is too short, and the bow, while cute, just ends up getting in the way more than serving a good purpose. Those are just 5 of the best cat harnesses out there, as recognized by online reviewers and cat owners alike! However, the decision to choose which cat harness is the best fit for your buddy rests solely on your top priorities in what a harness should encompass! Best of luck in your search for the purrfect cat harness. Let us know if you have questions or comments!